The 'close encounter' was officially reported by the flight crew of a Boeing 737 back in January 1995. The pilot and first officer described seeing a 'large grey object' fly so close past the plane it made them duck. The alleged incident on 6 January 1995 involving a passenger plane in the night sky above Manchester is included in the latest batch of MoD files documenting alleged UFO sightings now released by the National Archives. 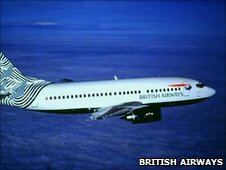 In a detailed report to the Civil Aviation Authority (CAA), the pilot confirmed that he was about 4,000 feet up over the Pennines, eight or nine miles south east of Manchester Airport, when the two men both saw something flash past the cockpit window. His first officer - who instinctively 'ducked' as it went by - said it was a 'wedge-shaped' object possibly with a black stripe down the side which he estimated was 'between a light aircraft and Jetstream' (a small passenger plane) in size. According to the CAA's Airmiss Working Party report, the captain and the first officer drew what they had seen. The pilot was convinced it had 'a number of small, white lights, rather like a Christmas tree' adding that he was able to track the object for around two seconds looking through the windscreen and side window. Both were convinced that what they had seen was 'a solid object and not a [meteorological] phenomenon, balloon or any other craft' with which they were familiar, including a Stealth bomber. The investigation failed to identify the object. 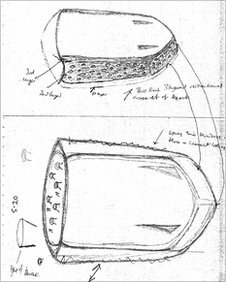 The National Archive files also contains a sketch by a member of the public showing a UFO allegedly seen from the ground on the same day as the near miss with the Boeing aircraft. It showed an oblong craft with a curved front and a series of small nozzles at the rear. However, a UFO expert who sent the sketches to the MoD said he was "a little dubious" about aspects of the report, including a claim that the object was "20 times the size of a football field." The 18 UFO files released on 5 August 2010 are the latest to come out as part of a three-year project between the MoD and the National Archives. The files are made up of more than 5,000 reports, letters and drawings from members of the public. Reports of sightings of UFOs peaked in 1996 in the UK - when science fiction drama The X Files was popular. According to the files, there were more than 600 reports in 1996, compared with an average of 240 in the previous five years.